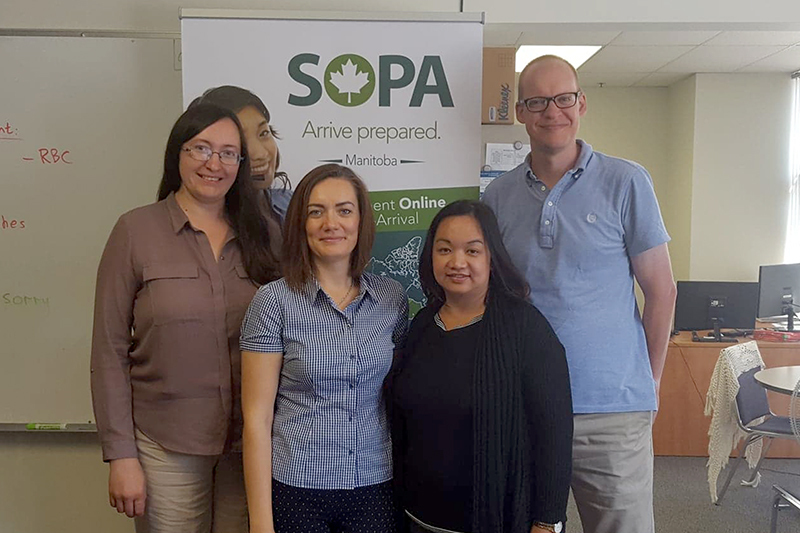 Yelena Petrukhina registered for the SOPA program in February 2018. Back in Kazakhstan she worked as an internship coordinator at a local university. She arrived in Winnipeg, Manitoba in May 2018 and 3 months later she landed her dream job! Today Yelena is sharing her success story with us. Q: Yelena, when and how did you hear about SOPA program and why did you decide to register? A: First I heard about the program in October 2017, when we had just submitted our documents for the Federal Skilled Worker stream. Our friend, who was going to move to Halifax was doing the ISANS courses, and she said that all the provinces have something similar. I did the research and found out the information about SOPA. I considered it to be very valuable source of job search information, and what made it more necessary to accomplish is the fact that you can gain the knowledge and finalized resume prior to your landing. Q: Could you please tell us which services you have received as part of the SOPA program? A: I had an intake session on settlement and attended one course – Job Search Strategies. Q: What knowledge and skills have you taken away from the Job Search Strategies course? A: I have learned how to determine what type of resume the job seeker needs to use for the particular position. It is very important to keep this information in mind. I have both chronological and functional resumes, and I had two interviews after I had sent both. Thanks to the course and my facilitator, I learned how to write the qualification skills, and job duties performed, as it requires certain knowledge as well. I received a good understanding of the interview process, developed my elevator pitch and had a chance to practice. What is good about SOPA is that you are not provided with the fish, you are provided with the fishing skills that will bring you the fish any time you need it. Q: After you arrived to Canada, how have you implemented the new knowledge and skills for your job search? A: I did the targeted resumes for each position I applied for, I started to do networking, and I started to volunteer. These three factors together helped me to get the job. Due to the professional targeted resume and networking, I managed to get the interview. My volunteer experience allowed me to get the necessary references. Q: What challenges have you faced on your way to find a job in Canada? A: The first challenge is that the newcomer needs to do a lot of paper work after arrival. You need to set up official documents, register kids at school, find a family doctor, acquire the driving license, etc. At the same time you need to look for a job. The second challenge is adapting to the local culture. It is different in many aspects, even in the way you are standing in a line at the bus stop. And the third challenge is the lack of knowledge of the local job market. Q: Where are you now in terms of your career? Q: What advice would you give to pre-arrival immigrants? A: I would advise people to use the time before arriving to Canada wisely. Do their best to take advantage of as many pre-arrival services as they can, it will save their time when they are in Canada, and help them to be job ready right after the arrival.